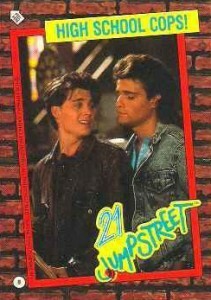 21 Jump Street (the TV show and not the movie) makes for a campy historical look back at the late 1980s. It's also proof that Johnny Depp can play a character that's not over-the-top and always moving his hands in strange ways. 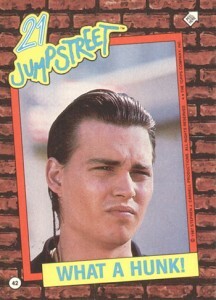 Rather, it's a simpler, hair-slicked-back Johnny Depp. 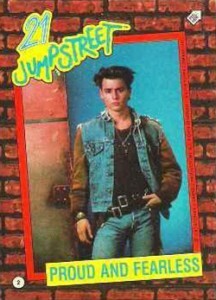 1987 Topps 21 Jump Street trading cards share that simple notion with a checklist that's about as basic as you can get. The cards are actually stickers if you want them to be. The set has 44 cards. A brick wall background lends itself to the graffiti-like logo. There's an image of a character inside a red frame and a yellow box at the bottom with a caption that's likely to make you grimace or groan. Backs are puzzle pieces and offer no further information or context. Due to its visual nature, the focus is entirely on the characters. 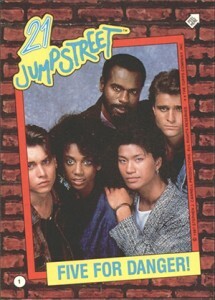 Depp's Hanson, there's Penhall (Peter DeLuise), Hoffs (Holly Robinson-Peete), Ioki (Dustin Nguyen) and Captain Fuller (Steven Williams). With 48 packs per box and five cards per pack, building this set is not difficult. 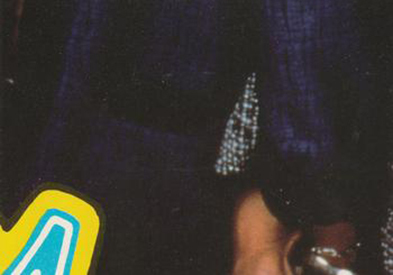 This has likely had a major impact on why the set can usually be found so cheaply and easily still today. 18 "To Protect & Serve"
25 A Fast Lane Life! 31 Hanson Takes a Break!